This article focuses on the experiences of judges’ families, particularly their sons, in battle in the First World War. It is both a memorial to the sacrifice made by the Australian judicial community in the First World War as well as a contribution to the limited historiography concerning the social history of Australian judges. This article continues research into the activities of the wider Australian legal profession in the First World War. The centenary of the birth of Sir Kenneth Jacobs provides the occasion to reflect upon his work as scholar and teacher, and then for 19 years as a judge at first instance in the Court of Appeal and finally, for all too short a time, in the High Court. In matters of both private and public law his judgments retain much significance and, for example, in his reading of s 92 of the Constitution he was remarkably prescient. “They’re not heroes. They do not intend to be thought or spoken of as heroes. They’re just ordinary Australians, doing their particular work as their country would wish them to do it. And pray God, Australians in days to come will be worthy of them”: C E W Bean, journalist, war correspondent, historian and author of the Official History of Australia in the War of 1914-1918. This article was inspired by the re-opening and re-dedication of the Burt Memorial Hall at St George’s Cathedral in Perth, built by the Hon Septimus Burt KC who lost two sons in the Great War. In looking at the life of a pioneer like Septimus, we see the story of a young nation, of how Western Australia was built, how its legal and political institutions developed and how they continued (and thrived) after the devastation of World War I.
David Malcolm Annual Memorial Lecture, 19 October 2016, Fremantle. 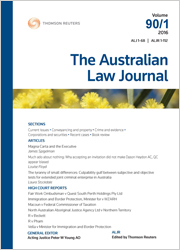 For the PDF version of the table of contents, click here: ALJ Vol 91 No 4 Contents.